Nintendo’s flagship franchise faces a problem that so many series’ this late in their game are susceptible to: fatigue. There have been five “New” games in about as many years, and we haven’t had a proper 3D Mario since 2010’s Super Mario Galaxy 2. Just earlier this year we had New Super Mario Bros. 2 on the 3DS, which was received in a decidedly mixed fashion. I think most people agree that Mario needs a jump-start, or a break, or anything that could mitigate what’s fast becoming over-saturation. New Super Mario Bros. U is an immaculate and pretty game that relieves none of that dread or tension. Bowser (or as I will stubbornly refer to him, King Koopa) has stolen the princess yet again, so Mario and his band of merry adventurers set out to rescue her. That band is exactly the same as New Super Mario Bros. Wii, namely Luigi, Blue and Yellow Toad. The Koopa Kids from Super Mario Bros. 3 return, each with their own airship and unpredictable (but still pretty predictable) boss maneuver. In fact, a great deal of U seems ripped wholesale from 3. The mid-boss is the same nameless, angry Koopa, and the world themes are practically the same (and are in practically the same order). The music, too, is largely remixed versions of previous Mario tunes, from 3 and others. The little bit of new music is easy to spot, because it’s much, much worse. The game even ends with a “Bowser’s dead but not really” fake-out that is far too reminiscent of Wii. The lack of new features in this so-called “New” game is especially disappointing, because what little change there is, is pretty fantastic. The highlight of these additions is the new Challenge mode, which runs normal Mario gameplay through a devilishly precise Super Meat Boy filter. These challenges range from time trials to levels where you must collect every coin or collect no coins. It’s a refreshing change of pace for a more experienced player. There’s also a new Flying Squirrel suit that allows you to glide great distances: like a Tanooki suit without the flight capability. It’s helpful, but reeks of a “been there, done that” feel as far as Mario power-ups are concerned. Yoshi is back, and with him new baby Yoshis who prove invaluable when you manage to find one. Mario (or Luigi, etc.) holds the aforementioned baby in front of him, and it eats every enemy in its path. There are also a couple new bonus Toad House variations, and special missions where you chase down a thief named Nabbit. The art style is graphically gorgeous, but often frustratingly bland. As a launch title, U more than fulfills its requirement of making use of the hardware, but this necessity is, predictably, both a blessing and a curse. The Wii U’s HD capability help to make Mario look better than ever, with crisp visuals and especially impressive lighting. It’s a shame, then, that Nintendo has chosen to stick so closely to the New Super Mario Bros. pre-established art style, which has always struck me as pretty sterile and by-the-numbers. Levels with unique hooks, like one that takes place in a painted forest, are the most notable of the bunch. In addition, the Wii U GamePad can be used to control Mario in the single-player mode. I’ll talk more about that controller when I publish my review of the console later this week, but the ability to switch from the TV to what is essentially a handheld in real-time is quite something. The game plays fine with that controller, too, but sometimes I found the run and jump buttons were easier to hit on a Wiimote. Probably the most glaring problem with U is how it handles multiplayer. While you can use the GamePad to control a character in the single-player, you straight up cannot do that in a game with 2-4 people. The minute a second player is introduced, every player must use a Wiimote. The GamePad becomes a designated “Boost Mode” controller for a fifth player. 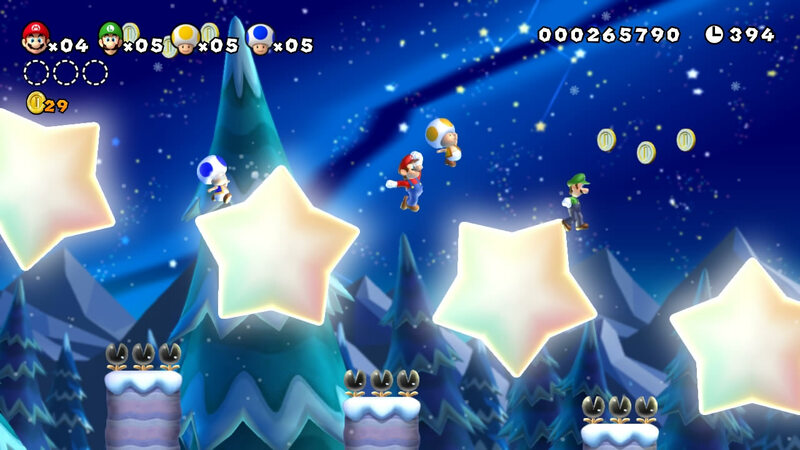 In Boost Mode, the player with the GamePad can set down platforms for Mario and his buddies to use. To recap: if you have only one Wiimote, you and a friend cannot play as Mario and Luigi. You need at least two controllers from the previous generation of console to access one of this game’s main features. 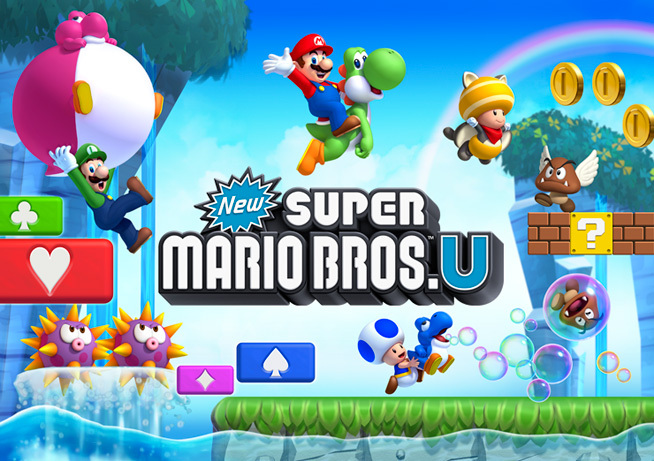 New Super Mario Bros. U is interesting, because it could very well represent the tipping point for a lot of Mario fans. If you’ve played every single one of these games to completion, and recently, this one might be hard to stomach. I’d be lying if I said I didn’t have fun with it; it is a Mario game after all, and Mario games are by and large fun. But part of me still wonders why Nintendo thought to headline their launch line-up with this, a game that not only is nearly identical to a game released on their handheld months earlier, but also one that misuses the key hook of the Wii U in an absolutely dreadful way. The best I can say about New Super Mario Bros. U is that it makes me look forward to what the series might have in store next. It’s hard for me to get too excited, though, because I’ve felt that way about most every New Super Mario Bros. game. In a year with countless fatiguing sequels, it’s depressingly cynical for Nintendo to put this game out, immaculate and pretty or not. thank god nobody reads this site. Its a score for hits. Well, if it actually is, then thanks for the hit!